1. "Can I use a clipart or graphic from one style of card and use it for another type of card or for labels"... the answer is YES... I love to mix and match and allow you to create your own item. So, if you see a notecard you like, but really want it as an enclosure card or label, just ask. 2. "Can I change the colors of the font and border, or even the font style?"... Sure! All of the border colors, font colors and font styles can be changed on any of the designs. And, in many cases (but not all), the clipart can be modified, too. Just be sure to email me with your question before ordering. 3. "Do you offer bulk or quantity discounts?" Again, the answer is YES. I have several listings for larger quantities, but if you don't find the specific quantity that you are looking for, just email me with your request and I will be happy to give you a quote. 4. "Do you sell to retail shops?" Certainly. I have several retail shops that carry a some of my monogram initial styles. Contact me for more information if you are a shop or boutique owner/manager. 5. "I've ordered before and would like to re-order the same product. Do you keep my order on file?" Absolutely! My return customer rate is very high, and growing each year. I keep back up files for up to two years (sometimes longer), so all you have to do is email me at thenotecardlady@gmail.com if you would like to order an identical product that you ordered in the past. 6. "Do you send an electronic proof?" In many cases I do, and if you request one, then I'll be glad to. Most of the items are pretty straightforward and do not require a proof. If there are font or color changes, then it is always a good idea. Invitations always require proof approval. 7. "Do you offer refunds?" Because these are custom, personalized items, I do not offer returns or refunds. However, if I make a mistake (it happens occasionally), then I will immediately reprint and ship your corrected cards or invites out asap. Hold on to your envelopes, as I will only send the corrected product. 8. "How long before you ship my order?" Once I receive you personalization information and payment (or approval if you have requested a proof), I typically print and mail out within 2-4 business days. 9. What type of printer(s) do you use?" I actually have a variety of printers. So depending on the particular card style that you purchase, I use the appropriate printer. Some printers print certain designs or colors better than others. I have a commercial color laser (used mostly for photo and primary color cards, as well as labels), and two high end laser jet printers. 10. "What type of paper or card stock do you use?" For all folded notecard or photo card designs I use a pre-cut Classic Crest Announcement stock, pre-scored for easy folding and white, Classic Crest envelopes. For Stationery sheets, I use a 32 lb, bright white, ultra smooth writing paper, and the same Classic Crest Envelopes. For invitations, flat correspondence, or calling/enclosure cards, I use an 80# Cover stock (heavier and smoother than 110# cardstock), bright white, ultra smooth. The stationery sheets and other flat items are HAND cut, never perforated! 11. "Can I buy a card or invitation without any wording so that I can print these myself?" Well, yes. However, I do not carry any pre-printed stock. Every single order received is printed individually, so even if you order a card or invite without wording, I still have to set up and print the design. Therefore, the prices are the same with or without personalization information. 12. "What program or template do you use for your designs?" I actually receive this question a lot. Many folks out there would like to either design their own items for personal use, or start a business selling stationery products. I do not use any purchased programs or templates. Everything in my store is my custom designs. I do purchase royalty free cliparts and graphics from a variety of vendors that I use on my custom designs, but the borders, colors, layouts, font styles, etc are my custom designs. 13. "Will you do a custom job for me, or use a logo or special design if I email it to you?" Absolutely. I have over 600 items listed in my store, and they did not come about overnight. It's actually taken over 10 years to build up my design inventory, and many, many of these have been "born" from customers special requests! I also work with many businesses who either have a logo that they want to use on stationery or notecards, or have me help them design a custom logo. I truly do love custom requests. Please contact me directly at thenotecardlady@gmail.com if you would like more information. Be sure to check out our current 4 Set Special below! #1226 4 Set Special~~Get 1 FREE! 4 SETS of Notecards for the price of 3! Get 1 set FREE! 48 Cards in all! You will receive 4 sets of 12 notecards/envelopes (each can be a different style). 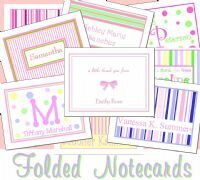 Choose any FOUR notecard styles in the store (excluding photo cards). Please enter the style item numbers along with your personalization information for each set in the box below.